High-stakes pack wars are a game I frequently see adult collectors play. It is a form of gambling in my opinion, but when done responsibly can be fun for those involved. In the game, two to four collectors square off opening packs and the person who gets the best cards out of the packs wins all the cards. Now if you are playing this game with some higher-end product, it can get serious very quickly which is why it is a game I would never play. And a game that children should not play as well. I have also heard collectors playing a different game where cards can be won, but had never seen it live until this weekend at the 2012 NHLPA Rookie Showcase event. A group of three rookies and two of their guests were seated at a table opening packs of 2011-12 NHL SP Authentic. They decided to play a game of hockey card poker and it was a lot of fun to see how they played it. Their rules were fairly simple, you play your best cards first by putting them in the center on the count of three. Whoever had the best card would win them all. They lay down the cards and the player with the best card dealt wins all of the cards in play. Tomas Jurco (red shirt) makes his case to win the hand, but it looks like Chris Kreider (gray shirt) will take this one as he grabs for the cards. The one thing that seemed to be missing was an element of bluffing and I have heard of other groups use that in their games. But as the night progressed it looked like Detroit Red Wings prospect Tomas Jurco (pronounced Toe-mas Yur-cho) was one of the big winners. 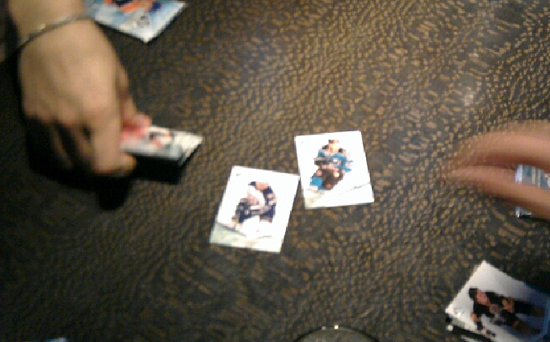 The whole group was smiling and enjoying trading cards in a unique new way which I thought was cool. 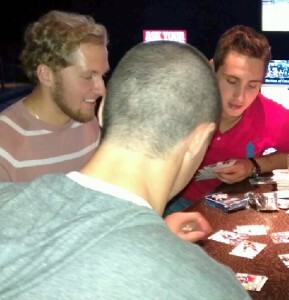 So, have any of you played hockey card poker and how do your rules differ from this group of rookies? 2017 Marvel Annual Pack Wars is Now Available on e-Pack!